Connacht face their first away trip of the new Pro14 championship blessed with a healthy squad when they meet Edinburgh in Murrayfield tomorrow evening (7.35pm ). 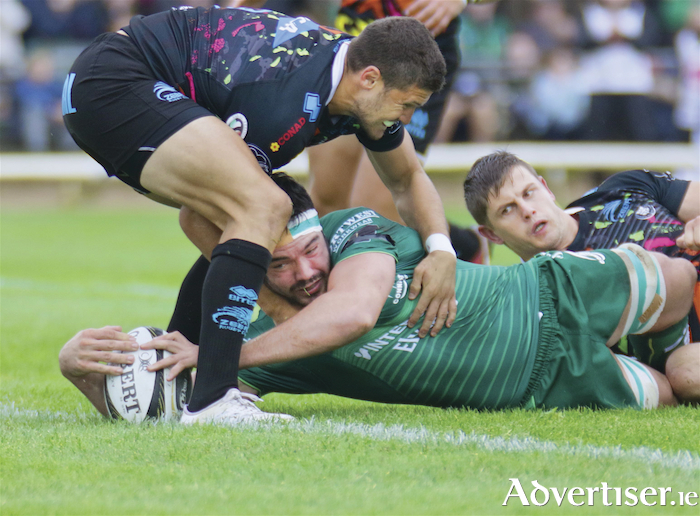 Relieved last weekend to have overcome Zebre with five tries and a bonus point, Connacht now face this Scottish outfit smarting after two defeats - albeit both were away from home. And as a result Richard Cockerill's squad will be gunning for the points in this first home outing, requiring Connacht to step it up another notch. To that end they have been boosted with the return of Ireland centre Bundee Aki, who has been made available by the IRFU, and coach Andy Friend expects to be also calling on locks Quinn Roux and Ultan Dilllane, and scrumhalf Kieran Marmion, who made his first appearance from the bench in the 32-13 win over Michael Bradley's Zebre. "Bundee is back, and the intention is to get him back in as soon as we can, " says Friend of Aki who has been actively involved from the sidelines, adding that the internationals will add" more stability and starch" for their visit to Murrayfield. Aki is expected to partner Kyle Godwin, with Tom Farrell ruled out for another week after suffering a virus last week, and having lost a "fair bit of weight". Also in contention are No 8 Robin Copeland and Colby Fainga'a, who made his first appearance off the bench against the Italians, but Friend has yet to decide if either will make the starting line-up. "Robin is training fully, but it is just how we mange his entry. We'll make a decision in the next couple of days." Of Fainga'a, he says: "Potentially we could start him, but I am big on rewarding performance." In that regard, he said blindside flanker Sean O'Brien, back for his first game last weekend, played "really well", while both captain Jarrad Butler and Paul Boyle could not be faulted. "I think as a player, you need to be rewarded for those performances. Boyle is a young man who has just made every post a winner this year. He got the Man of the Match from the pundits, but more importantly also from his peers he got the Players' Player, so it's hard not to continue picking a player like that when he is in the form he is in. "Colby is a 100 cap Super Rugby player, and he could easily come and in and fill it, but do we drop a bloke because Colby is coming back? Not sure yet. "What is pleasing is we have some real depth and quality coming through, it's how we balance it while rewarding good performances at the same time. And we need that physicality against this Edinburgh side." Cockerill has already stated Edinburgh will be looking to get in front and control the game, and backrow Hamish Watson, ready to return after the birth of his daughter, is just one of many internationals Cockerill has at his disposal. "We know Edinburgh are smarting from two losses," says Friend. "You watch the first 50 minutes of the Ulster game and they are a hell of a side, so they will be really upset with that. They are back in front of home crowd, and will do all they can to kickstart their season, so we know what's coming and we have to respect that, but at the same time we have to do a job. "The focus is for us to get 15 players on the same page. Our theme is 'small talk'," he says of the players' communication on the field - to encourage each other and "pat a teammate on the back" if he does a good job. "Little points in these games are big. Kicking accuracy can often determine games, but for me it's our defence. I think these big games in the championship are won on defence. You need to stand up and make your tackles, deny the opposition time and space, but if you leak early, like we did against Glasgow, then you have to chase a game and it becomes difficult from there." Connacht's defence was the stand-out feature that had Zebre on the back foot on Saturday in the Sportsground. Up 17-3 at the break, Connacht stopped Zebre's attack at source and claimed a comfortable win, conceding only one try at the death in front of 4,056 spectators. "Defensively much much better," he says. "We were found napping sometimes against Glasgow and I have to take responsibility for that. We talked about tempo, but we didn't address the defensive side of it, so we had a massive emphasis on defence and we shut them out in that first 20 minutes. They wanted to attack, and there were not allowed, and that laid the platform for us. " Fashioned by a spirited forward pack, and a tenacious and a well organised defence, Connacht took control from the kick-off, posted an early penalty, and by the eighth minute had capitalised on a Zebre knock-on when scrumhalf Caolan Blade's break set up Man of the Match Boyle who barged through two tackles for his first try. On 20 minutes the former Ireland U20 captain struck again after a Jarrad Butler line-out take and drive for a 17-0 lead, and Michael Bradley's Zebre, who won home and away last season, could only post a penalty from Italian outhalf Carlo Canno. It did not get any better for an indisciplined Parma outfit who lost two players to the sinbin when Blade scored from an attacking five-metre scrum.Outhalf Jack Carty continued to produce some probing kicks, and his low grubber enabled centre Eoin Griffin to secure the fourth try and bonus point after 59 minutes - the pack once again setting up the platform with a dominant scrum. Boyle was again in the right place to send replacement Niyi Adeolokun in for the fifth to crown a solid home performance. The 20-year-old Wexford-born Boyle, promoted from the Connacht Academy, has caught Friend's eye. "In his first performance in pre season, I said 'who the hell is this bloke', and the message to the whole squad is that age is not a barrier, and Paul is testament to that. He has continued to deliver, and when you watch his game, he carries hard, tackles, hard, knows his role, bounces off the ground quick - it's a simple formula and he's doing it really well and definitely deserved the Man of the Match accolade. "It is important for the players to understand: perform poorly and you aren't staying there, and the blokes underneath get the reward."